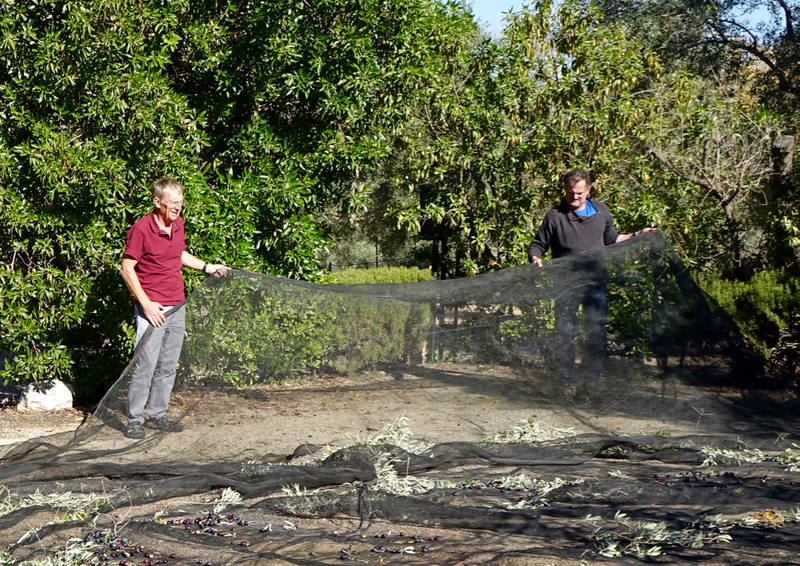 After giving Mathilde and Rick a little help with their olive harvest, and laden down with freshly pressed olive oil, we moved a little further north to spend a couple of days at a campsite close to the centre of Córdoba. 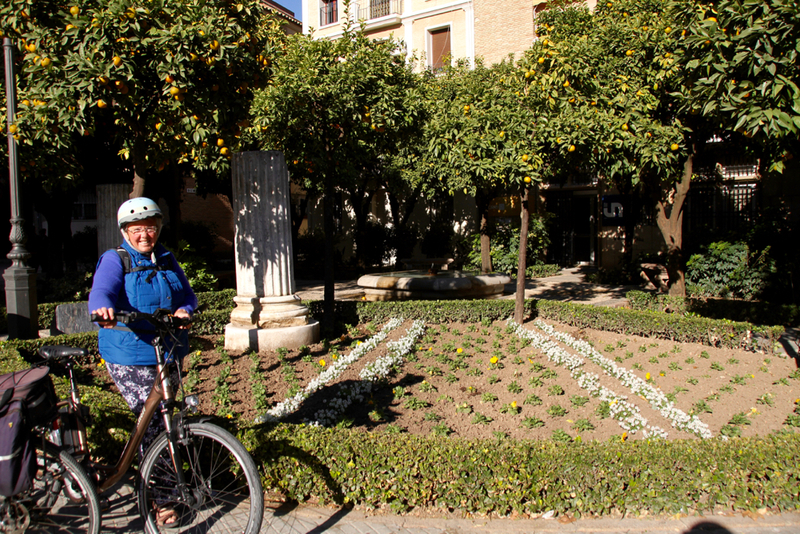 The tiny streets of the old town lend themselves to exploration on bike. 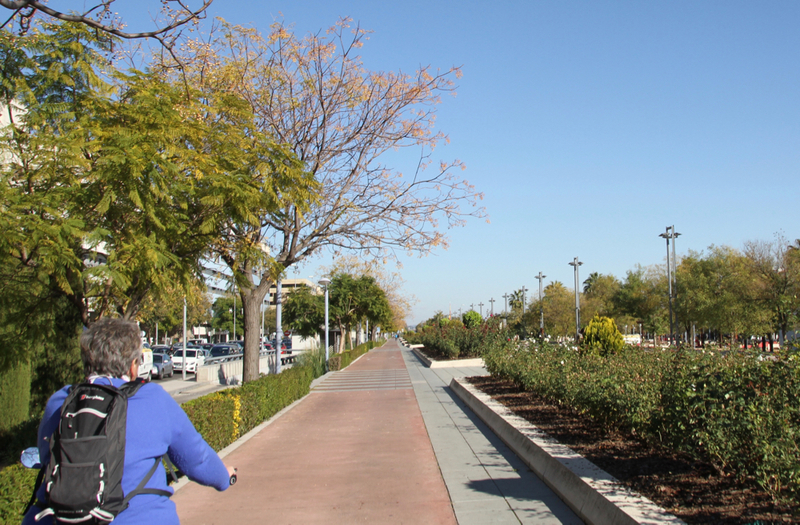 And there are good cycleways leading in the town. 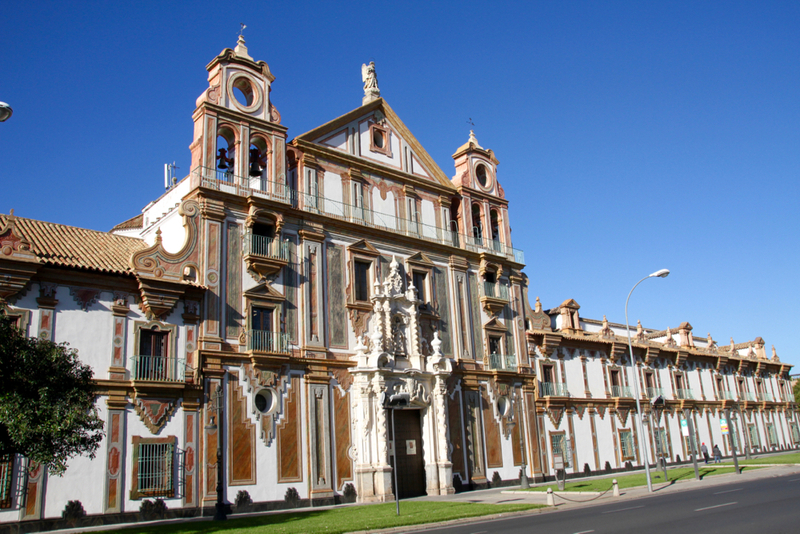 This old convent, its elegant facade dating from 1745 is on the route in to town. It is now used as an administrative centre. 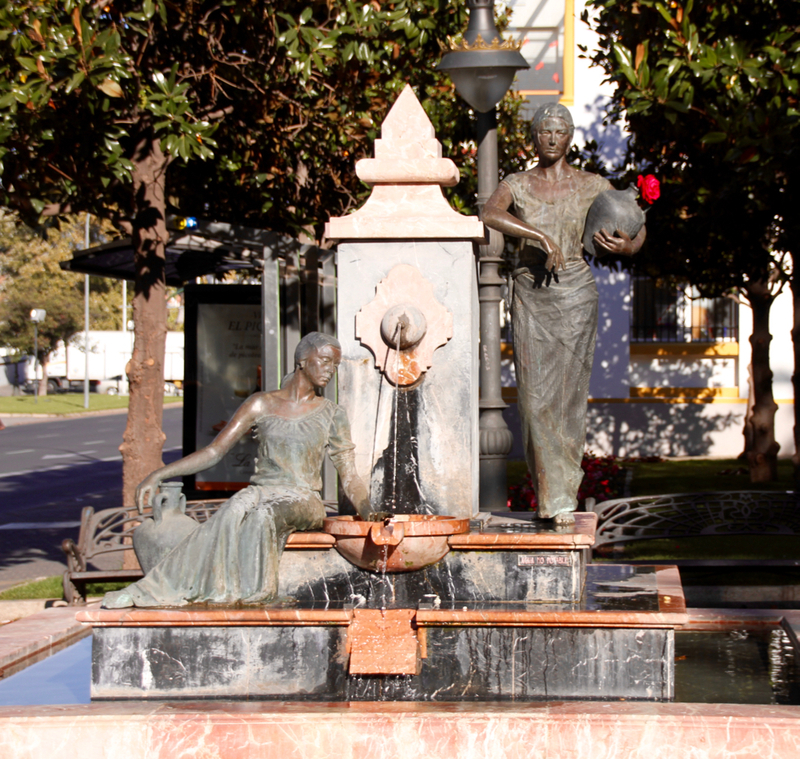 There is a large park by the convent, with a statue dedicated to the women of Córdoba. 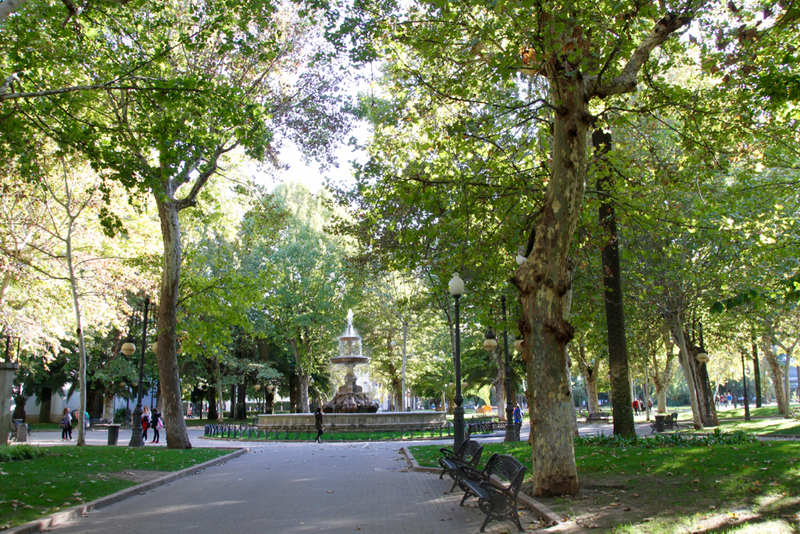 This is the pretty little Plaza Doblas, just beyond the gardens of the Merced. 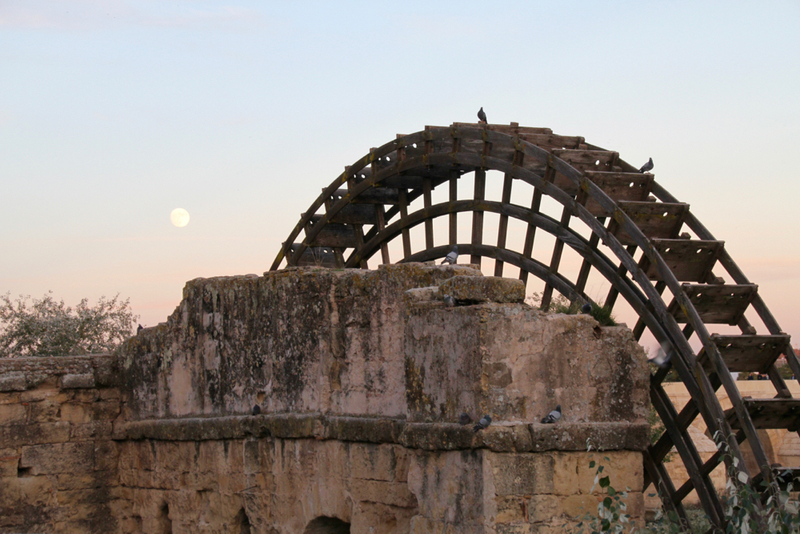 We swung on into town, heading towards a Roman temple. The temple is just beyond the town hall where we passed a small but vocal demonstration. 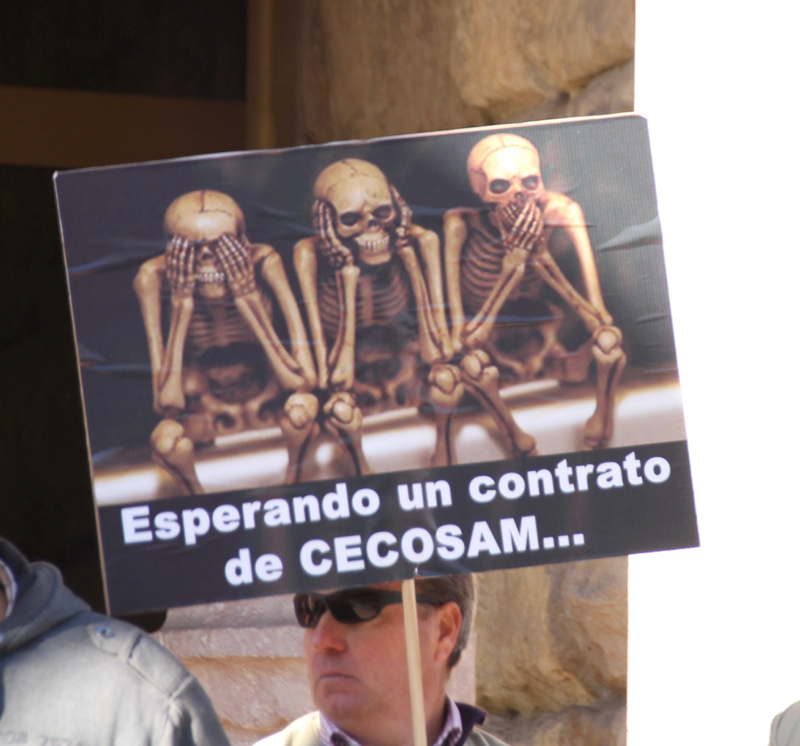 I think these guys need a new contract. Quickly. 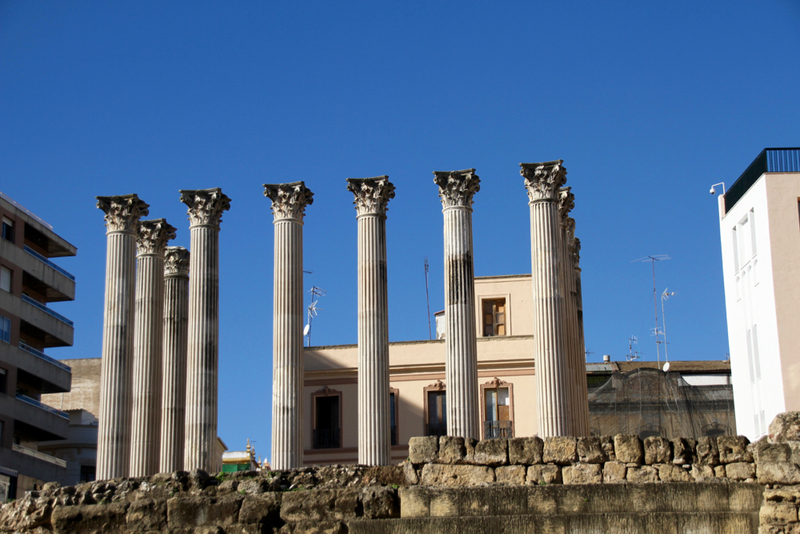 These are the remains of a temple dedicated to a Roman emperor…sorry don’t know which one. 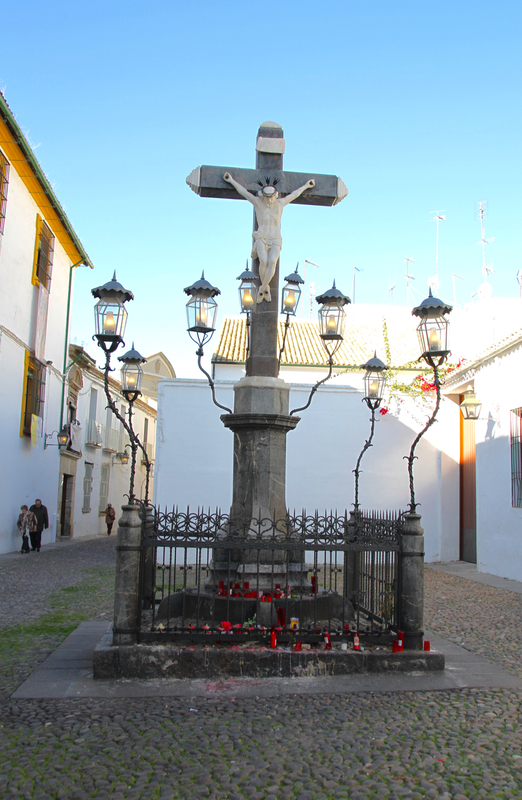 There are many shrines and other religious statues throughout the old city. 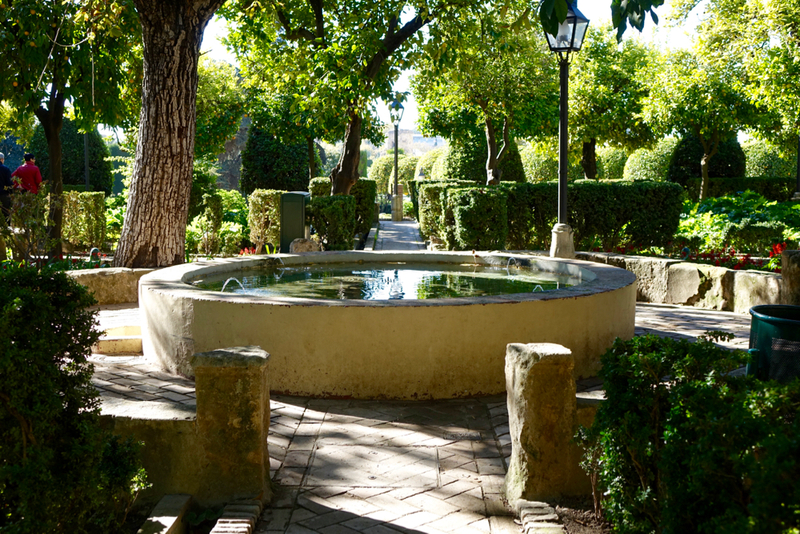 A little further on is the handsome Plaza de Corredara, from the 17th century. 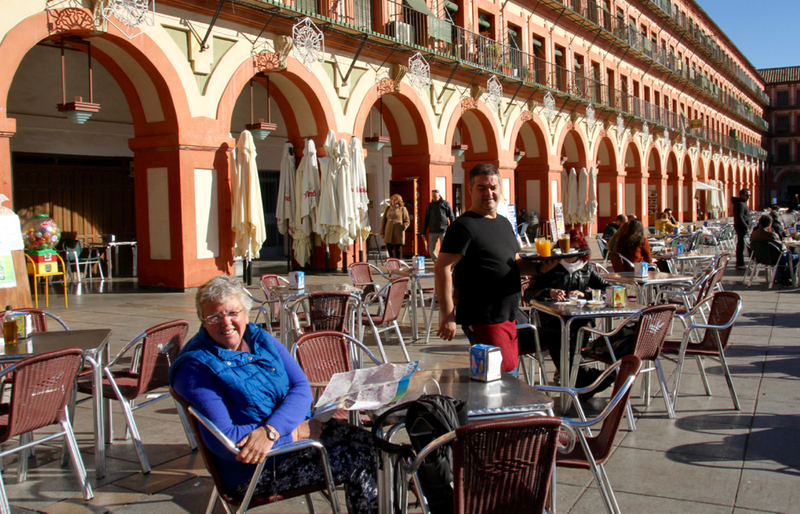 This is a good coffee stop, wide enough for the tables on the side to be in full sun for most of the day…yes the sun is getting a bit low in the sky now…summer must be coming to an end. 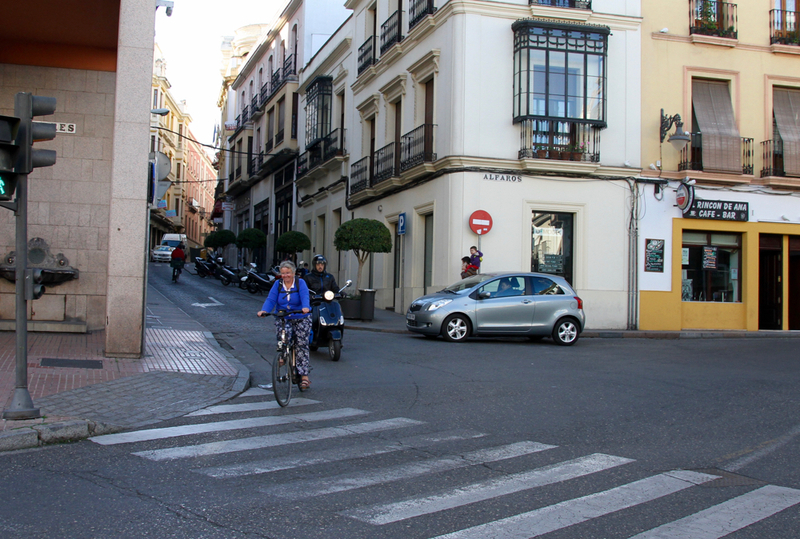 There are a few touristy shops scattered around…anyone else out there learning Spanish? 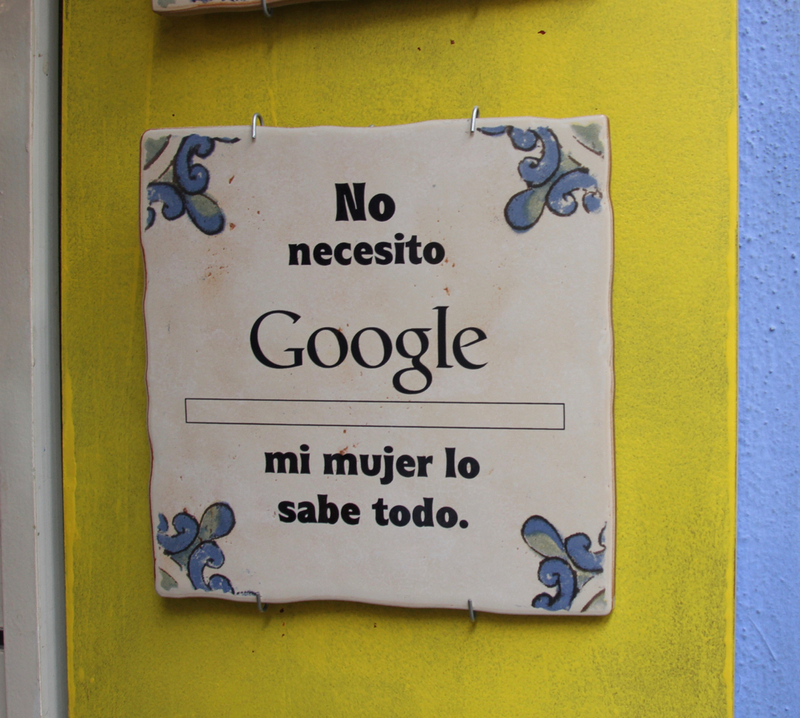 I didn’t buy this…don’t want to upset the Missus. After coffee we cycled past the Bridge Gate. 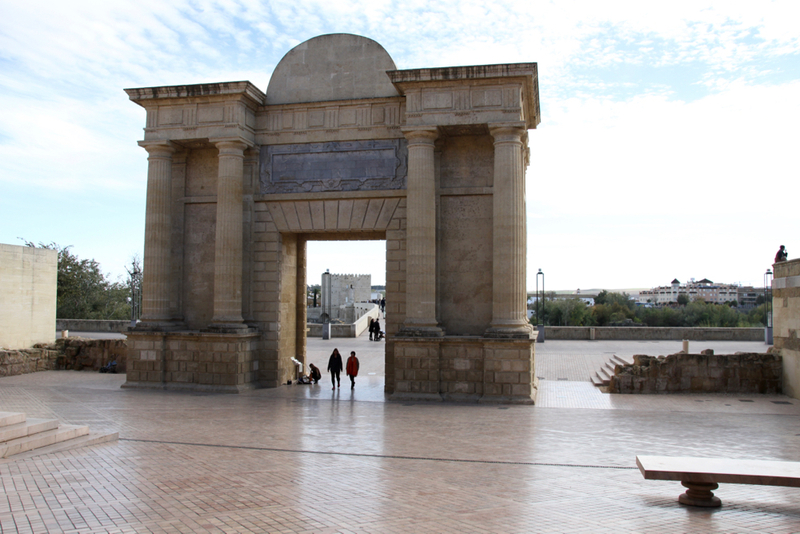 Originally it served as a gate for the Roman bridge just beyond. 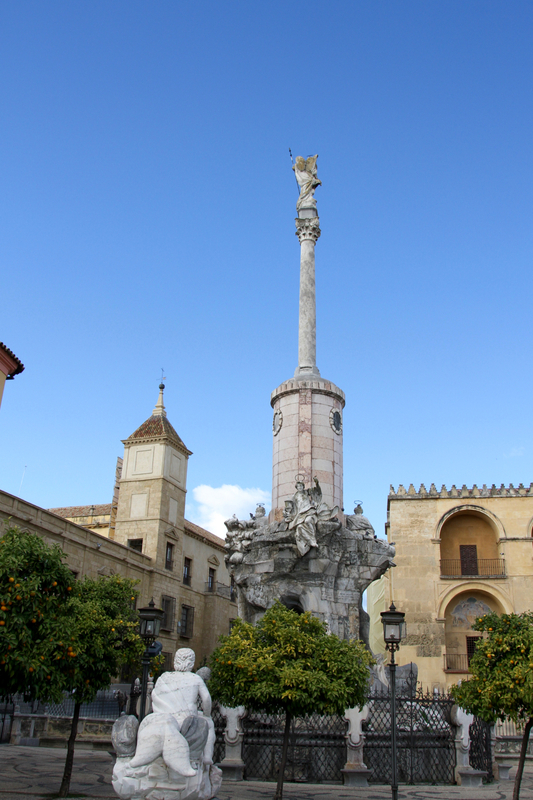 Saint Raphael is the protector of Córdoba. This statue in his honour, by the French artist Verdiguier in 1765, stands next to the Bridge gate. 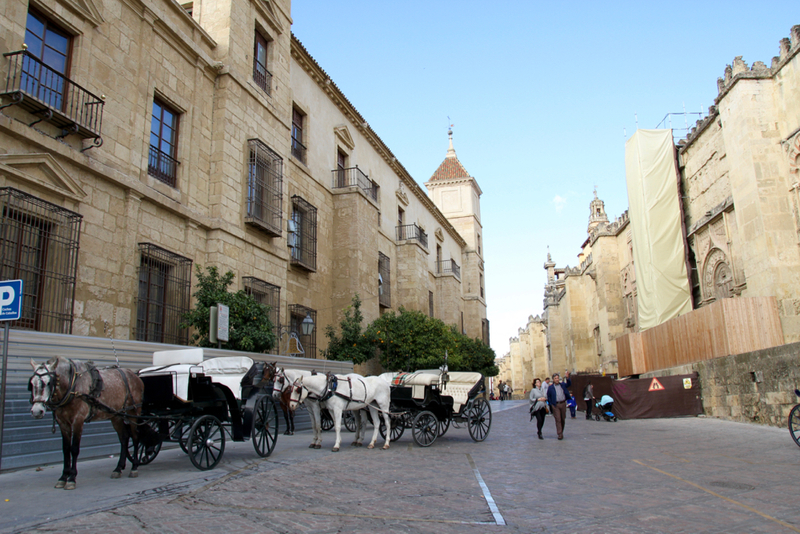 Horses and carriages are drawn up next to the Bishop’s palace, over the road from the Mezquita, ready to ferry visitors around. 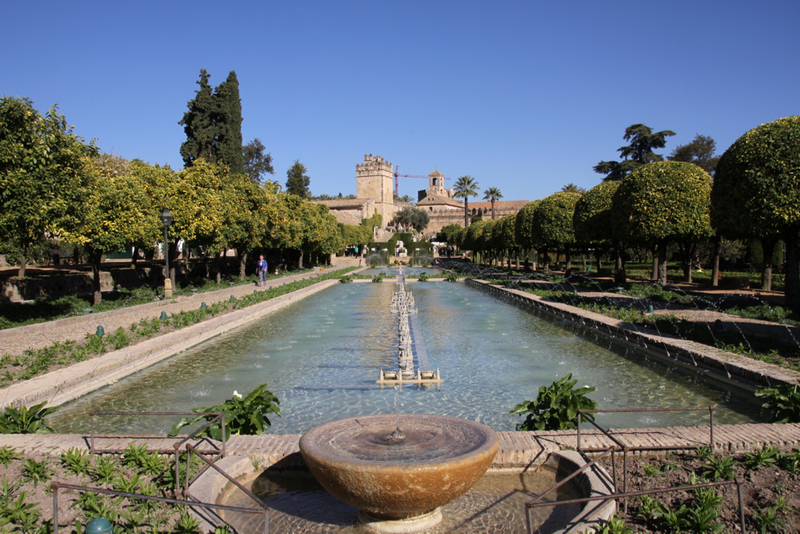 Next stop the stunning Alcazar…the Palace of the Catholic Kings. 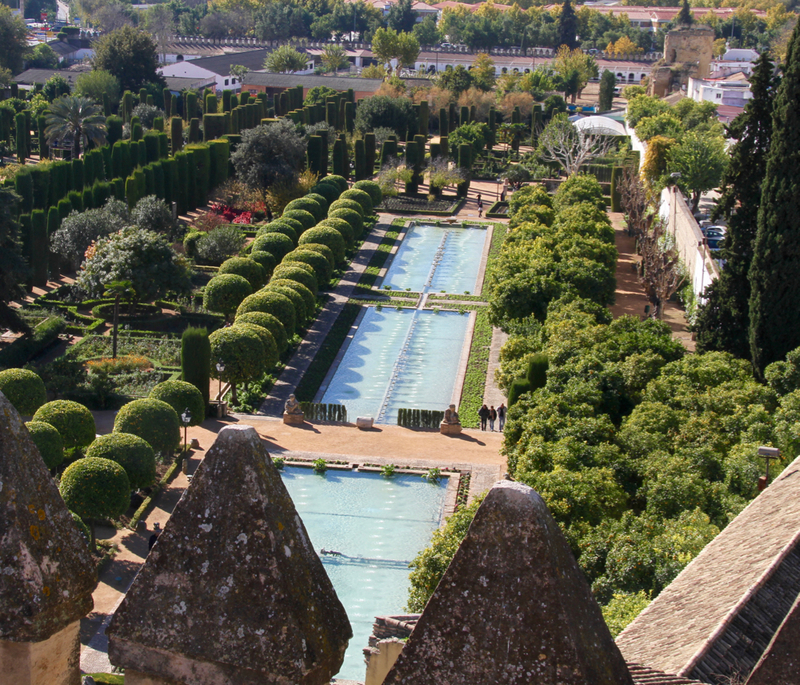 The Alcazar is a palace close to the Mezquita, on the north bank of the Guadalquivir. 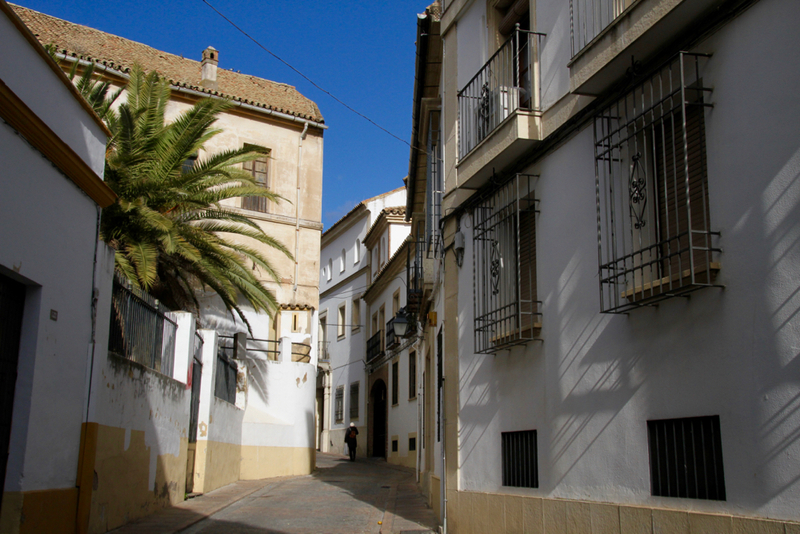 For many centuries it has been a temporary residence for Spanish royalty. 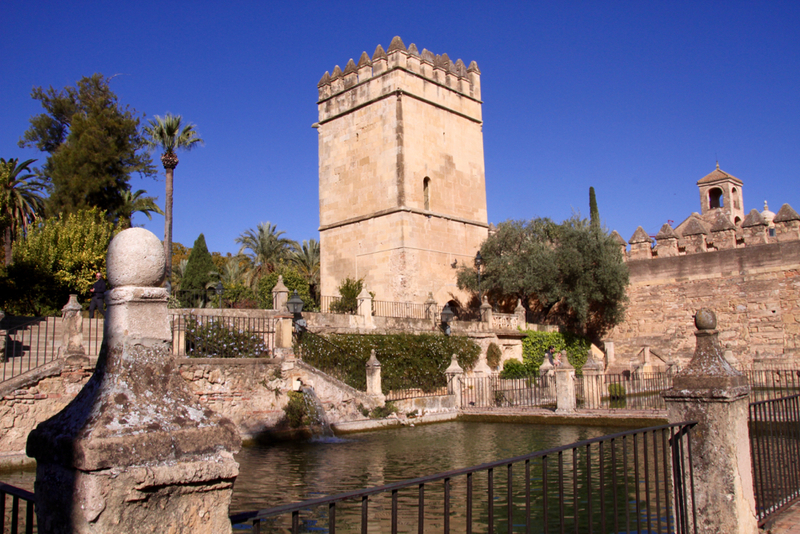 The palace is most closely linked to Queen Isabella and King Ferdinand, who spent much time here, where they planned the reconquest of Granada from the Moors. After this period, the palace became centre of operations for the Spanish Inquisition, until the early 1800’s. 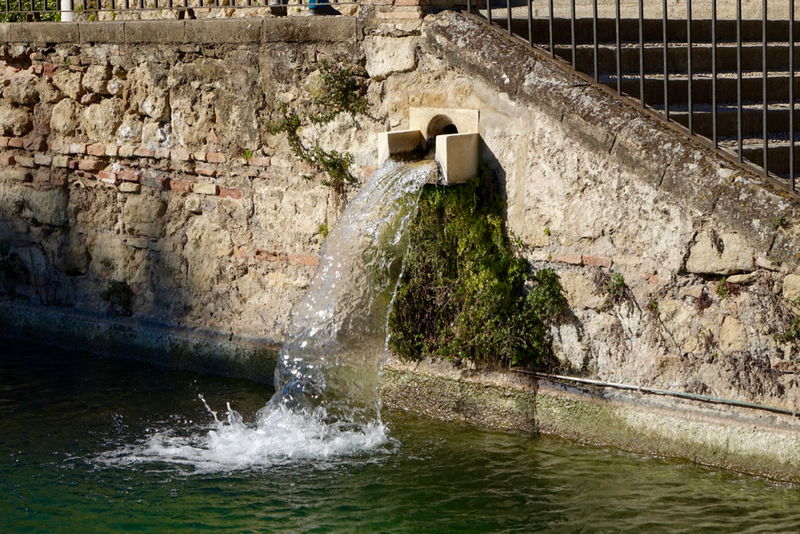 Under Moorish rule, the Alcazar was the site of extensive public baths, traces of which still remain. The palace itself was enclosed by four towers, three of which remain, and high fortified walls. 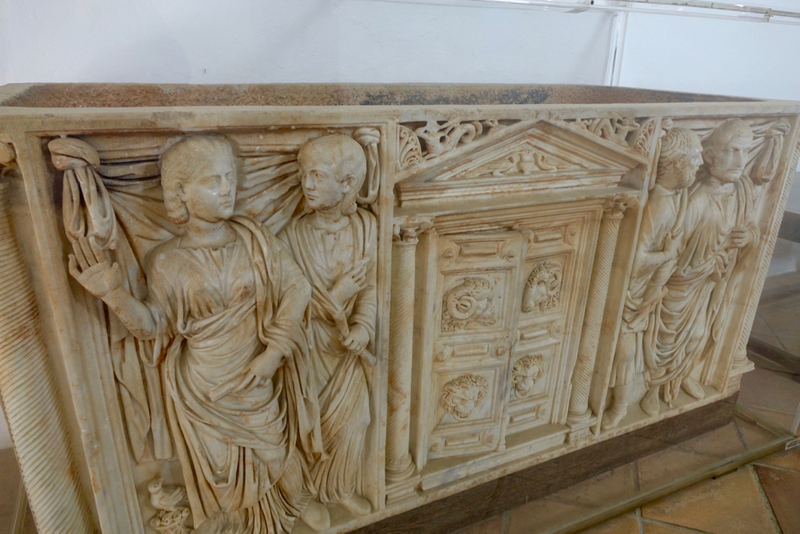 On view inside are a collection of relics including this Roman sarcophagus, intricately carved with reliefs of philosophers. Useful companions for the trip to the underworld. There is an impressive collection of well-preserved Roman mosaics, dug up from underneath the Plaza Carretera, where we had had coffee previously. 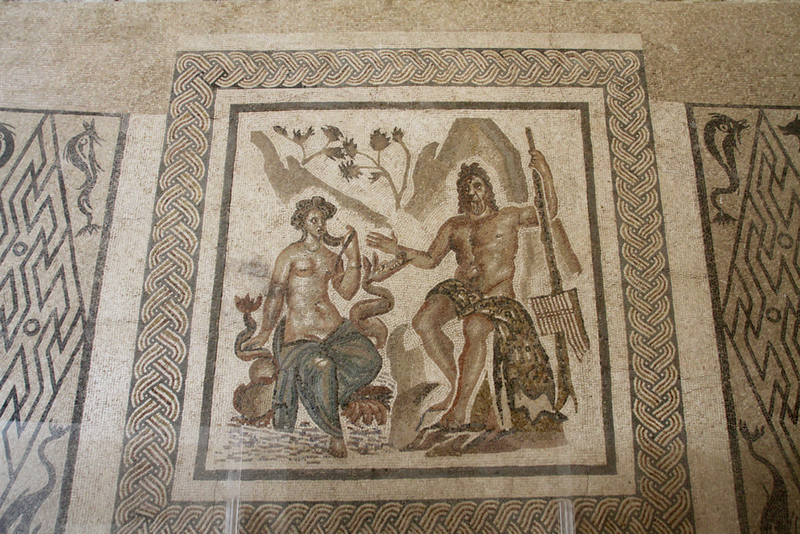 This depicts the attempted seduction of Galatea by the cyclops Polyphemus, Neptune’s brother. 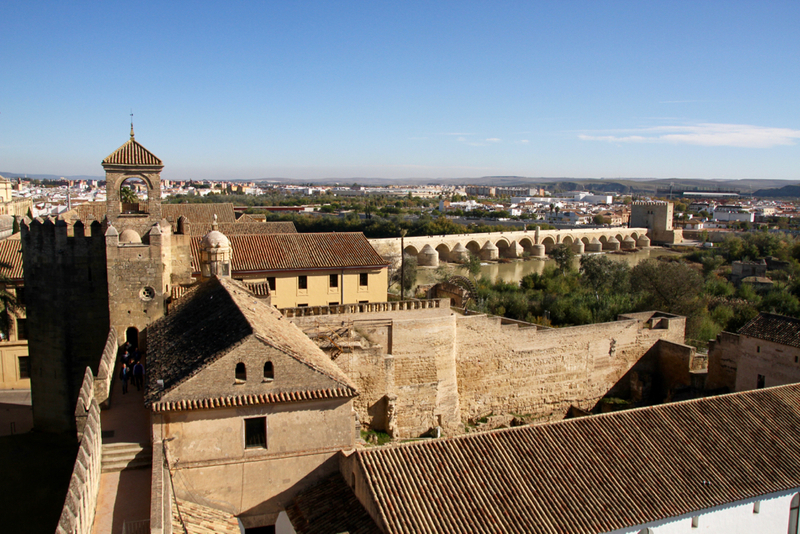 There are good views of the Mezquita and the Roman Bridge from the towers of the Alcazar. 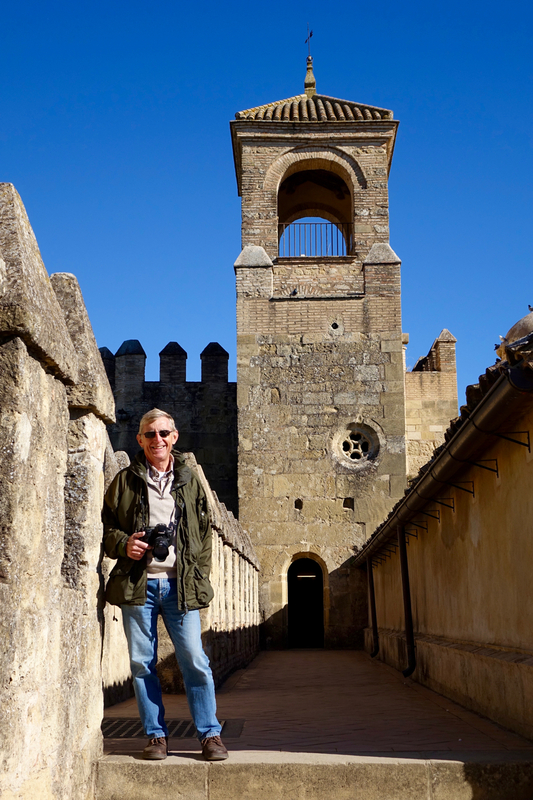 On the Battlements leading to the Tower of Homage. 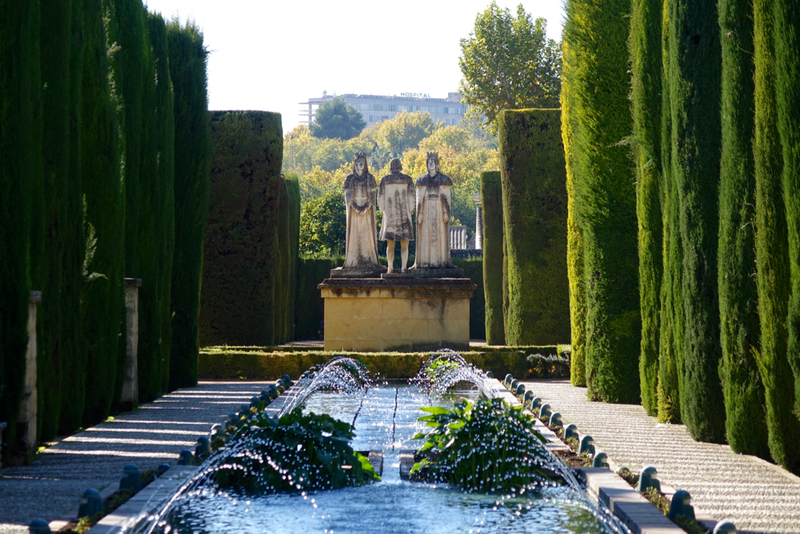 The palace has extensive and attractive gardens. 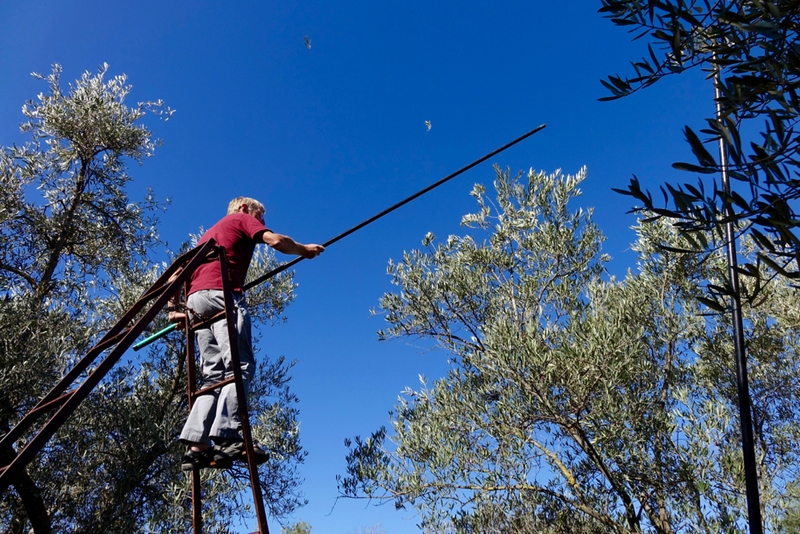 These spread around two sets of pools and include fruit groves and innumerable walkways through lines of trees and hedges. There are many statues dotted around. 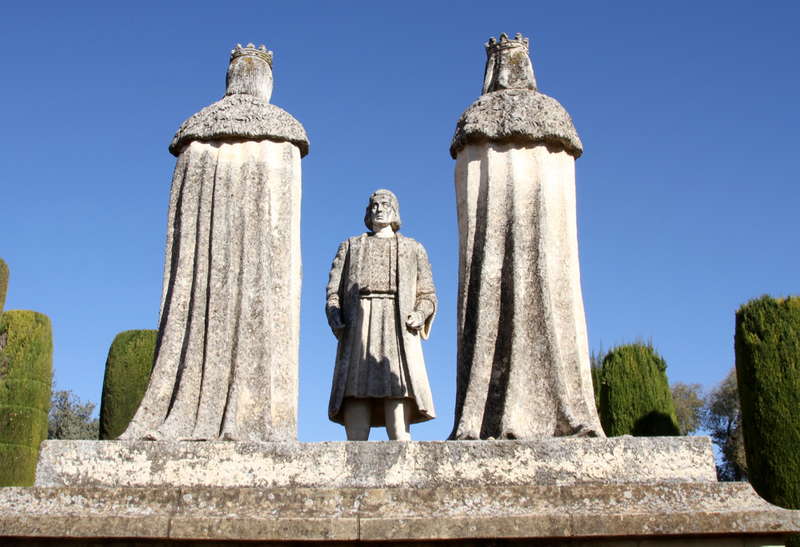 This one depicts Christopher Columbus pitching his exploration schemes to Isabella and Ferdinand, in the hope of getting some backing. Distracted by their campaigns against the Moors they weren’t initially receptive but eventually agreed to fund him. The rest, as they say, is history. 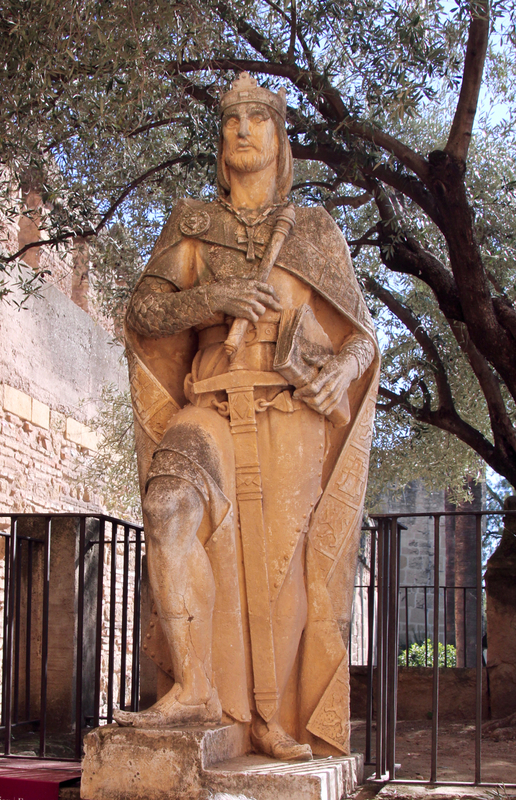 This is King Alphonse, who set out to build the Alcazar, in the early 1300’s, to be both his home and a military fortress. 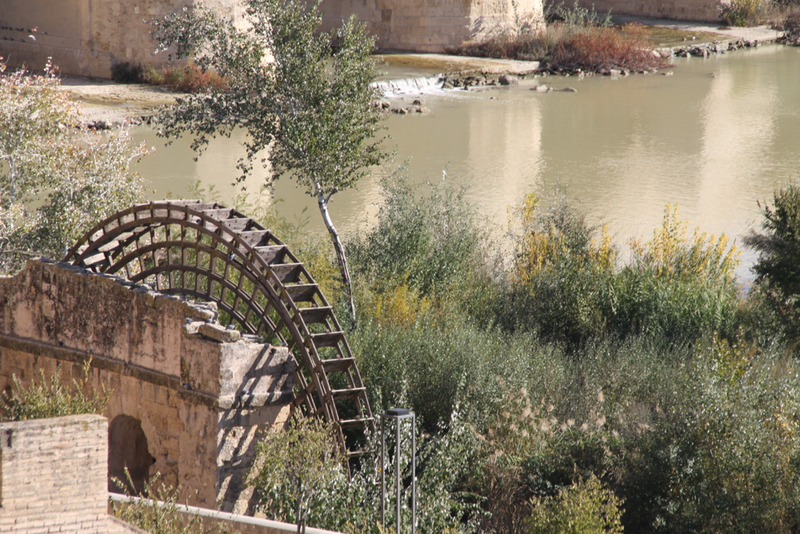 This is the Albolafia Mill, built by the Moors to lift water up from the river to water the gardens by their baths on the site of the Alcazar. It was ordered to be stopped by Queen Isabella because the noise disturbed her sleep. I bet she was high maintenance. 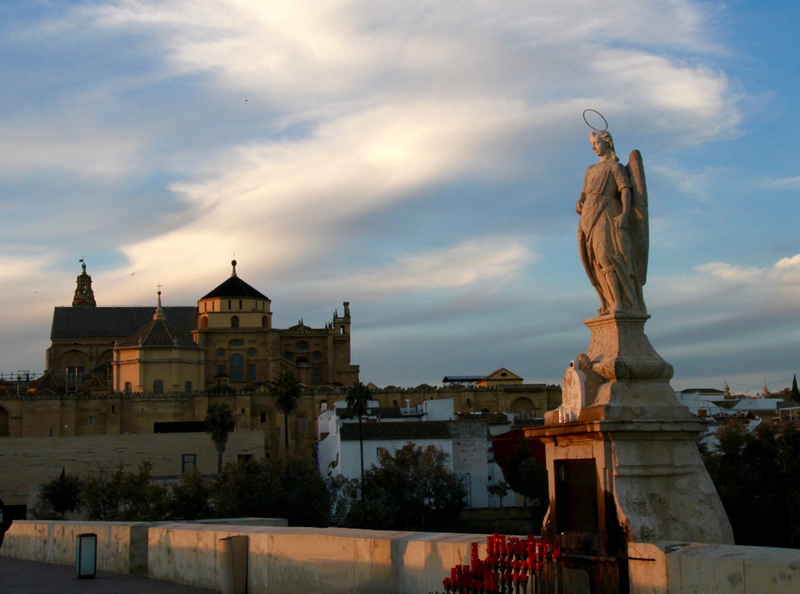 With night falling we cycled on to the bridge for some final shots of St Raphael as he kept watch over Córdoba. It is time to start heading back north now…this may be the last post. But I see it’s time to head home so as to get ready for a family Christmas ,probably a white one judging by the rain we’ve had, Wet grass cutting for the last month. Thanks Tony…nice to hear from you again. And thanks for driveway offer…we will take you up on that one day, tho’ not this trip I think. 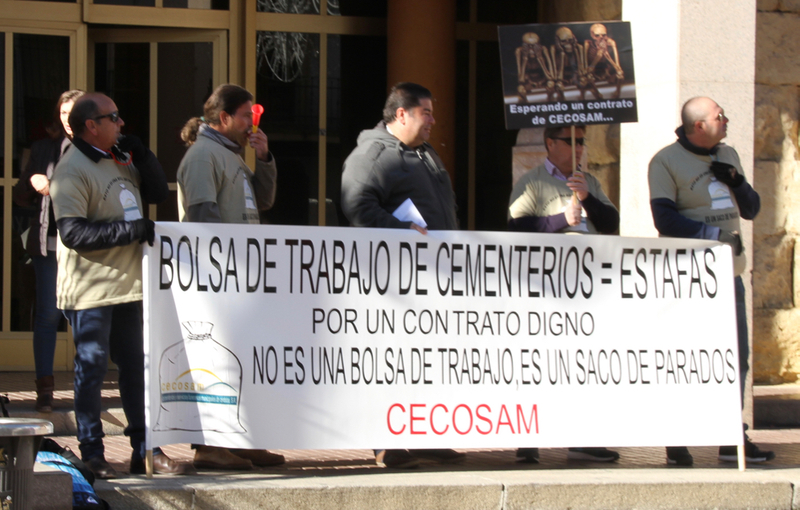 Special thanks for the tour of Cordoba! Straight to it ……. a techy question regarding your wordpress blog. How have you managed your “Places Visited” widget. I am trying hard to copy yours but am wondering whether the theme (The Chateau theme) I have is stopping me. Am enjoying reading your news and next year we hope to get to France (for Le Tour) with our two boys. Hi Peter, Congratulations on “getting published” in the March 2016 issue of MMM. I’m looking forward to a good read over a coffee! I take it that this was your previous Concorde and not the one that you’ve just toured with. It was great to read about your travels. I trust that you’ve escaped the worst of the weather on your return. Yes..we missed the floods. When are you on tour next? Probably June, but last November we took the rash decision to trade up and are awaiting delivery of a new AutoTrail in April. The snagging and customising will then start again. Whether or not we go abroad so soon depends upon how the new van behaves! Good article of yours. Well done.